Apply even, neat coats of your favorite tire dressing with Flex Foam. The top layer of foam on the Flex Foam Tire Dressing Applicator is made of dense, closed-cell foam that will not absorb tire dressing. Grip the applicator on this yellow foam to keep your hands clean. The open-cell, gray foam absorbs excess tire dressing to prevent drips and pooling around letters. However, the foam has very small, dense cells to keep the tire dressing near the surface, rather than soaking entirely into the foam. Flex Foam’s density reduces product waste and provides even, thin coverage of tire dressings. The foam is indented on each side to provide a place to grip the pad. Note: To prevent tire dressing from slinging, manufacturers recommend applying multiple, very thin coats of tire dressing. 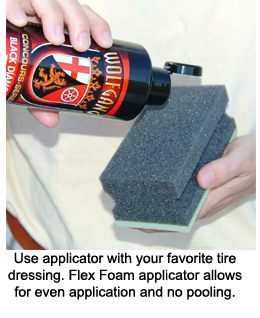 Flex Foam Tire Dressing Applicators has dense foam to help control the amount of dressing applied to the rubber in order to prevent sling. 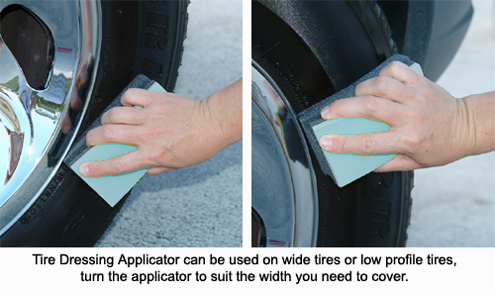 Flex Foam Tire Dressing Applicators are each 5 inches long by 2 inches wide. You can cover most of a regular car tire in one pass! Three pads are included per pack.